To all residents of the Cass County Conservation District, notice is hereby given that on Tuesday, December 4, 2018 between the hours of 5:00pm-7:00pm at the Pokagon Community Center a District Board of Directors Election will be held. The election is being held to fill new terms for two (2) Board of Director positions. Candidates include: John Green, Bernie Williamson, and Scott Wyman (incumbent). The election will be conducted during the District Annual Meeting being held on December 4, 2018 from 5:30-8:00pm at the Pokagon Band Community Center, 27043 Potawatomi Trail, Dowagiac, MI 49047. The Annual Meeting will feature “Conservation Practices Working in Cass County”, awards ceremony, and annual report. Voting is open to Cass County residents only. Absentee ballots are available at the Conservation District located at 1127 E. State St., Cassopolis, MI weekdays 8:00am-4:30pm except Federal Holidays. Eligible voters are individuals of legal age who can demonstrate residency in Cass County, Michigan via one (1) piece of identification. For more information call (269) 445-8641 extension 5. This notice is published at least forty-five (45) days prior to date of the Election as required by Conservation District Law. 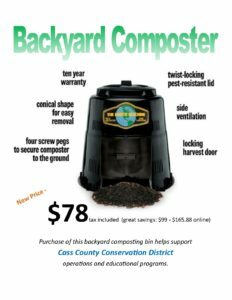 Cass County Conservation District is an Equal Opportunity Provider and Employer.